The induction of sterile immunity and long lasting protection against malaria has been effectively achieved by immunization with sporozoites attenuated by gamma-irradiation or through deletion of genes. For mice immunized with radiation attenuated sporozoites (RAS) it has been shown that intrahepatic effector memory CD8+ T cells are critical for protection. Recent studies have shown that immunization with genetically attenuated parasites (GAP) in mice is also conferred by liver effector memory CD8+ T cells. In this study we analysed effector memory cell responses after immunization of GAP that lack the P52 protein. We demonstrate that immunization with p52-GAP sporozoites also results in a strong increase of effector memory CD8+ T cells, even 6 months after immunization, whereas no specific CD4+ effector T cells response could be detected. In addition, we show that the increase of effector memory CD8+ T cells is specific for the liver and not for the spleen or lymph nodes. These results indicate that immunization of mice with P. berghei p52-GAP results in immune responses that are comparable to those induced by RAS or GAP lacking expression of UIS3 or UIS4, with an important role implicated for intrahepatic effector memory CD8+ T cells. The knowledge of the mediators of protective immunity after immunization with different GAP is important for the further development of vaccines consisting of genetically attenuated sporozoites. Immunization studies using live radiation-attenuated sporozoites (RAS) demonstrated full protection against subsequent challenge with infectious plasmodial sporozoites in mice, in non-human primates, and in humans [reviewed in ]. This protection is now known to be mediated by complex mechanisms involving both antibody and T cell responses [reviewed in ]. The long-lasting RAS-induced sterile immunity in mice is characterized by the establishment of a CD44highCD45RBlowCD62Llow subset of memory CD8+ T cells (but not of CD4+ T cells) in the liver but not in the spleen [3, 4]. Recently, it has been shown that genetically attenuated parasites (GAP), lacking conserved sporozoite-specific genes that are important for development inside the hepatocyte, can induce partial or complete protective immunity in rodent models of malaria [5–10]. We have previously characterized the immunization potential of P. berghei p52-GAP [7, 9] that do not express the sporozoite-specific microneme protein P52 (PBANKA_100220; also known as P36p) . Here, we sought to quantify memory lymphocytes, elicited by immunizations with p52-GAP, which may play a role in maintenance in the long-lasting immunity conferred by these attenuated parasites. We show that the long-lasting protection elicited by this GAP is coincident with the presence and persistence of an expanded population of CD8+ effector memory T cells found only in the liver. We have recently shown that BALB/c mice immunized with p52-GAP are protected when challenged with infectious P. berghei sporozoites 6 months later, without requiring additional boosts . 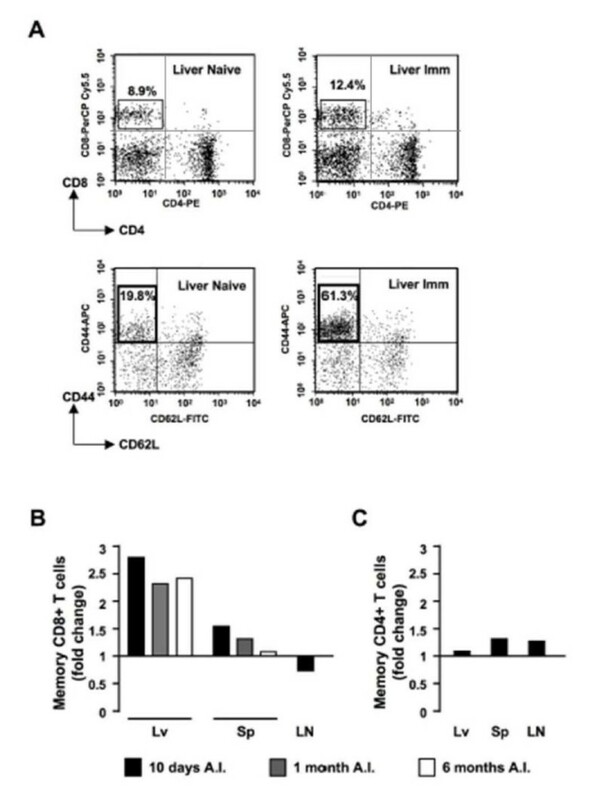 Immunological memory in RAS-immunized C57BL6 mice is associated with the establishment of effector memory CD8+ T cells found in the liver, but not in the spleen [3, 4]. Similar results were observed for P. berghei double knockout uis3-/uis4-GAP in C57BL6 mice  and P. yoelii uis4-GAP in BALB/c mice . To determine whether similar cells are elicited by p52-GAP, we quantified effector memory CD8+ T cells in different organs of GAP-immunized BALB/c mice (this study was carried out in strict accordance with the recommendations of both the Animal Experiment Committees governed by section 18 of the Experiments on Animals Act and registered by the Dutch Inspectorate for Health, Protection and Veterinary Public Health (Ministry of Health, Welfare and Sport), and the Portuguese official Veterinary Directorate, which complies with the Portuguese Law (Portaria 1005/92); the Dutch and Portuguese Experiments on Animal Act strictly comply with the European Guideline 86/609/EEC and follow the Federation of European Laboratory Animal Science Associations guidelines and recommendations concerning laboratory animal welfare. In The Netherlands, all animal experiments were approved by the Animal Experiments Committee of the LUMC (ADEC). In Portugal, all animal experiments were approved by the Portuguese official veterinary department for welfare licensing and the Instituto Gulbenkian de Ciencia Animal Ethics Committee). Six-week old female BALB/c mice (Instituto Gulbenkian de Ciência, Oeiras, Portugal) were immunized intravenously with 50,000 p52- P. berghei sporozoites (ANKA strain, expressing GFP , obtained by hand dissection of infected mosquitoes ). p52-GAP-immunized mice were sacrificed at different times post-immunization (10 days, 1 and 6 months) to collect livers, spleens and lymph nodes, from which non- parenchymal cells were isolated as described previously [3, 4, 15]. In parallel, mice immunized identically were challenged with 10,000 infectious P. berghei ANKA sporozoites, confirming full protection against subsequent infection, at all the time points (10 days, 1 and 6 months) memory cells were analysed (data not shown). For fluorescence-associated cell sorting (FACS) analyses, lymphocytes were incubated with fluorochrome-conjugated antibodies for 15 minutes on ice, washed and resuspended for FACS acquisition on a flow cytometer FACSCalibur (BD Biosciences). For each group of mice, a representative pool of cells was analyzed. Memory CD8+ T cells were quantified using the combination of CD8-PerCP-Cy5/CD44-APC/CD62L-FITC antibodies (Pharmingen). The numbers of CD8+ effector memory T cell (CD44highCD62Llow) increased nearly three-fold in the livers of immunized versus naïve mice when measured 10 days post-immunization (Figure 1A, B). At 1 month post-immunization, the CD8+CD44highCD62Llow cell population was still ~2.5-fold higher in the livers of immunized versus naïve mice, and remained at the same level 6 months post-immunization (Figure 1B). In the spleens of p52-GAP-immunized mice, only a modest increase (~1.5 fold) in the number of CD8+ effector memory T cells was observed 10 days post-immunization (Figure 1B), returning to basal levels 1 month post-immunization (Figure 1B). The initial site of induction of memory CD8+ T cells found in the liver after immunization with attenuated sporozoites is unclear. It has been suggested that it occurs in the liver itself or that such cells are induced in draining lymph nodes, from where they migrate to the liver following sporozoite challenge . We therefore quantified effector memory CD8+ T cells in the lymph nodes of non-immunized and p52-GAP-immunized mice, 10 days post-immunization. No increase in effector memory CD8+ T cells was observed in the immunized mice (Figure 1B), suggesting that the liver rather than lymph nodes is probably the principal site of induction of memory T cells following p52-GAP immunization. Effector memory CD8 + and CD4 + T cells in naïve and p52 - immunized mice. For each analysed organ, cell populations were defined as either CD8+ or CD4+ T cells, and subpopulations of effector memory cells within those populations were defined as CD44highCD62Llow. (A) Flow cytometry analysis of CD8+CD44highCD62Llow memory T cells in the liver of naïve (left panels) or immunized (Imm, right panels) mice 10 days after immunization with p52- sporozoites. Although the levels of CD8+ T cells are similar in both naïve and Imm mice (8.9% versus 12.4%, upper panels), the percentage of CD8+ effector memory cells is much higher in Imm than in naïve mice (61.3% versus 19.8%, lower panels). Values refer to percentage of cells in the respective quadrant. (B) Relative proportion (fold increase) of CD8+ effector memory T cells in naïve and immunized mice (n = 3 per group) in liver (Lv), spleen (Sp) and lymph nodes (LN) at different time points after immunization (A.I.). Effector memory CD8+ T cells were quantified as shown in (A) and results are displayed as fold increase in immunized mice over naive mice. (C) Relative proportion of CD4+CD44highCD62Llow (effector) memory T cells in the same immunized and naïve mice as shown in (B). These cells were quantified as described in (B) from mice at 10 days after immunization. FACS analyses were performed on pooled cells from three animals within the same group, and 100,000 to 200,000 events per each phenotype studied were analysed. CD4+ effector memory T cells are not induced after immunization with p52- sporozoites. Protection against chronic infections like malaria requires robust responses by the lymphocyte arm of the adaptive immune system, and relies on induction and maintenance of immunological memory. In our studies with p52-GAP, maintenance of protective immune responses after the first immunization in BALB/c mice required no additional boosting by challenge infections, for example, and mice remained fully protected for up to 6 months . We found that maintaining protective immunity beyond this 6 months period, however, does require de novo antigen presentation via, for example, additional challenge infection with sporozoites. Renewed antigen exposure thus seems to be necessary to maintain full protective immune responses over prolonged periods after the initial GAP immunization. RAS-immunized mice indeed require the presence of antigen to maintain protective immunity , through re-stimulation of intrahepatic memory T cells . Such re-stimulation can comprise challenge infection with wild-type parasites or may result from the presence of persisting antigen [reviewed in 18]. Persistence of plasmodial antigen can derive from either residual parasites in the liver or in the form of circulating parasite proteins or peptide-MHC complexes. It has been suggested that apoptotic infected hepatocytes could provide plasmodial antigens to professional APC [reviewed in [2, 18]]. These would consequently migrate from the liver and act like an antigen depot, explaining why mice treated with drugs to clear intrahepatic parasite load can still be protected [17–19]. Also, antigenic load supplied by the different immunization strategies appears to be a critical factor; a high dose of antigen would mean a larger antigen depot, therefore inducing a more long-lasting protection [reviewed in [2, 18]]. We found that, in p52-GAP-immunized mice, the population of CD8+ effector memory T cells in the liver, at 10 days post-immunization, is greater than that observed at later time points, most probably indicating depletion or exhaustion of the antigen depot. A very recent work states that antigen persistence occurs in live- and RAS- immunized mice even upon drug treatment to clear the liver parasites . In these conditions, the development of a CD8+ T cell response was also efficient, but not when heat-killed sporozoites were used, indicating that only metabolically active parasites can act as source of antigen. Therefore, as seems to be the case for RAS-induced protection [17–19], p52-GAP-induced protective immune responses appear to depend on continuous antigen presentation provided by a persisting antigen depot. In the study presented here, perhaps not unexpectedly, we observed similarities between the immune responses induced by GAP and RAS. As already reported for RAS [3, 4], P. berghei uis3-/uis4- GAP  and P. yoelii uis4-GAP , p52-GAP immunization elicits effector memory CD8+ T cells solely in the liver and not in the spleen or lymph nodes, indicating that organ-specific responses in the liver are probably crucial for the establishment of long-lasting protection in this system. Although priming of CD8+ T cells against plasmodial sporozoites' antigens occurs also in skin-draining lymph nodes, hepatocytes can also present plasmodial antigens via MHC classe I [reviewed in ]. The later would be more efficient, since a broader range of antigens (from both sporozoite and liver developing plasmodial schizont) would be presented to the immune system. Also, the vast majority of sporozoites reach the liver shortly after inoculation, strengthening the hypothesis that most of the induction of immune cells occurs in the liver. Regarding effector memory CD4+ T cells, their numbers remain unchanged following p52-GAP immunization, as has been found in RAS-immunized mice , implying no major role for these cells in the protection conferred by attenuated parasites. Our results, together with those of others [3, 4, 12, 13, 18, 20], strongly emphasize the role of the liver, and particularly of intrahepatic effector memory CD8+ T cells, in the maintenance of the sterile immunity conferred by attenuated plasmodial sporozoites. We thank Denise L Doolan for helpful scientific discussions and Alina Costa for excellent technical support. BD and SE were recipients of fellowships from Fundação para a Ciência e Tecnologia (SFRH/16813/BD/2004 and SFRH/BPD/12188/2003, respectively). B.S-S is an EMBO YIP (Installation Grant 1440). M.M.M. is an EMBO YIP, is a recipient of a EURYI Award from European Science Foundation and is a Howard Hughes Medical Institute International Scholar. SE is supported by FAPESP (Fundação de Amparo à Pesquisa do Estado de São Paulo, Brazil). BD performed mice liver stage infection and immunizations assays, organs collection, non-parenchymal cells extraction and staining, FACS, data analysis and participated both in the study design and manuscript draft. MRvD, SKM, CJJ, APW and RWS participated in the study design. GJvG reared and infected the mosquitoes with wild-type and p52- P. berghei parasites used in this work. AJFL coordinated GJvG work and participated in the study design. BS-S co-supervised BD, performed FACS, data analysis, designed the study and participated in its coordination. MMM supervised BD and SE, conceived and coordinated the study, participated in its design and manuscript preparation. SE co-supervised BD, optimized and performed the technique for extraction and purification of non-parenchymal cells and organ collection, participated in both design and coordination of the study and manuscript preparation. All authors read and approved final manuscript.